Research on the fractional order system is becoming more and more popular. Most of the fractional order controller design methods focus on single-input-single-output processes. 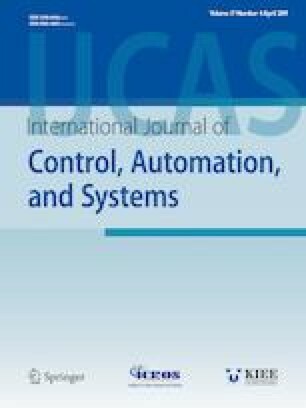 In this paper, a fractional order internal model controller with inverted decoupling is proposed to handle non-integer order two-input-two-output systems with time delay. The fractional order two-input-two-output (FO-TITO) process is decoupled by inverted decoupling method. The fractional order internal model control (IMC) is then used to simplify the tuning process. Because of the complexity of multiple time delay, the condition of FO-TITO process with time delay is discussed. In order to ensure the robustness of the system, a Maximum sensitivity function is used to tune the parameters. Then Lyapunov stability theory is applied to verify the stability of the system. The proposed controller provides ideal performance for both set point-tracking and disturbance rejection and is robust to process gain variations. Numerical results show the performance of the proposed method. Recommended by Associate Editor Niket Kaisare under the direction of Editor Young IL Lee. This research has been supported in part by the National Natural Science Foundation of China (61873022, 61573052), in part by the Beijing Natural Science Foundation (4182045) and in part by the Fundamental Research Funds for the Central Universities under Grant XK1802-4. Dazi Li received the Ph.D. degree in engineering from the Department of Electrical and Electronic Systems, Kyushu University, Fukuoka, Japan, in 2004. She is currently a Full Professor and Chair of Department of Automation, College of Information Science and Technology, Beijing University of Chemical Technology, Beijing, China. Her current research interests include machine learning and artificial intelligence, advanced process control, complex system modeling and optimization. Dr. Li is currently an Associate Editor of ISA Transactions. Xingyu He received the B.S. degree in automation from the Department of Automation, Beijing University of Chemical Technology, Beijing, China, in 2011, where he is currently pursuing the M.S. degree with the College of Information Science and Technology. His current research interests include fractional order control. Tianheng Song received the M.S. and Ph.D. degrees in control science and engineering from the Department of Automation, Beijing University of Chemical Technology, Beijing, China, in 2011 and 2016, respectively, where he is currently a postdoctoral fellow with the College of Information Science and Technology. His current research interests include reinforcement learning. Qibing jin received the Ph.D. degree in control theory and engineering from the Northeastern University, Shenyang, Liaoning, China, in 1999. He is currently a Full Professor with the college of Information Science and Technology, the Director of the Institute of Automation with the Beijing University of Chemical Technology, Beijing, China. His main research interests include advanced control, intelligent instrument, Intelligent optimization algorithm, multivariable system identification and control theory. He has rich experience in control engineering, and his many research results have been applied in petroleum and chemical industry.